Plans to build an outdoor swimming pool on Brighton beach were unanimously approved by councillors last night (April 3). 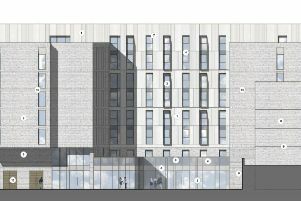 The proposed 25-metre pool – known as Sea Lanes – was given temporary permission for five years by Brighton and Hove City Council’s planning committee. The decision sparked celebrations in the council chamber at Hove Town Hall after the team behind the project had been praised for responding positively after an earlier application was turned down. They hope to build the pool complex at the old Peter Pan amusement site between Madeira Drive and Volk’s Railway, just west of the Yellowave volleyball pitches. The plans include one and two-storey moveable modular buildings with a first-floor deck. They are intended to provide a flexible events space and a mixture of shops, cafés, restaurants and offices. Brighton and Hove Conservation Advisory Group opposed the scheme, saying that it would restrict the view from Madeira Terraces. It also criticised the proposed use of black rubber cladding. Green councillor Phélim Mac Cafferty said that any steel used in the buildings should be marine grade steel to prevent it becoming a “rust fest”. He was also concerned about a proposed condition requiring the “vegetated shingle” to be maintained for 10 years even though the application was for only five years. But he was told that the requirement would be legally enforceable. Fellow Green councillor Leo Littman described 10 years as “nothing in ecological terms” and asked for the prospect of a 25-year requirement to maintain the shingle. He was told that it would disproportionate but he put the request to the vote and councillors voted six to four for the longer period. Councillor Littman said that he had compared the previous planning application, which was rejected in December, with the current proposal. Labour councillor Clare Moonan voted for the scheme when the Planning Committee considered it last year. It was the last meeting for Conservative councillor Lynda Hyde, who previously chaired the Planning Committee and who previously opposed the project. She said that the new scheme was for an “enviable” facility. She said: “I said the previous application was ‘hideous’. This is no longer the case. Conservative councillor Carol Theobald voted for the scheme last time and said that she hoped it would be turned into a 50-metre pool. Fellow Conservative Denise Cobb described herself as a year-round swimmer and surfer who welcomed the pool as way of a teaching people how to swim in sea currents safely. After the meeting, Sea Lanes director Joe McNulty said: “We are delighted the council granted permission. He said that if it worked commercially then the company would consider building a 50-metre pool. Mr McNulty said that work was expected to start at the end of this year and he hoped that it would be open by April next year. The revised application included changes to the height – reduced by 1.27 metres – with gaps to give sea views and a softer colour palette. It also included green roofs and a larger “vegetated shingle” bank between Yellowave and Banjo Groyne.